Master Bath Classic Look "AFTER"
This master bathroom was a 1980 builder’s standard that the homeowner wanted to remodel. We created a new look using classic Carrera marble for the floors, shower walls, and vanity top. 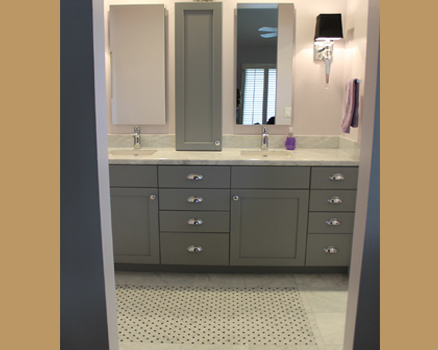 The double sink vanity provides ample storage finished with a medium grey paint. The 2 new medicine cabinets are flanked with crystal and chrome wall sconces, top with a dramatic black shade. A feature “rug” design of basket weave tile completes the room. The adjacent room’s shower is modernized with large scale marble tile on the walls, accented with the basket wave tile on the shower floor. The glass shower panel swings out to allow access to the valve control. The original room door was modified when we created a pocket door. A new towel shelf is accessible above the new toilet. The light lilac walls make these 2 small spaces feel larger and bright. The LED recessed lighting completes the makeover.